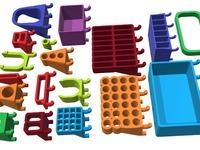 These are nesting cups for the Husky 10-compartment interlocking small parts organizer bins. I'm not sure if the bins are the same size as the bins in other Husky organizers. 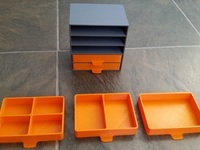 I've uploaded an STL for a single divider bin, and I've also uploaded the Fusion 360 archive if you want to modify it.